President Donald Trump just partially defunded Planned Parenthood, immediately cutting $60 million it was receiving from taxpayers. In fact, the president has devastated the abortion mills and their supporters by outsmarting them at their own game. 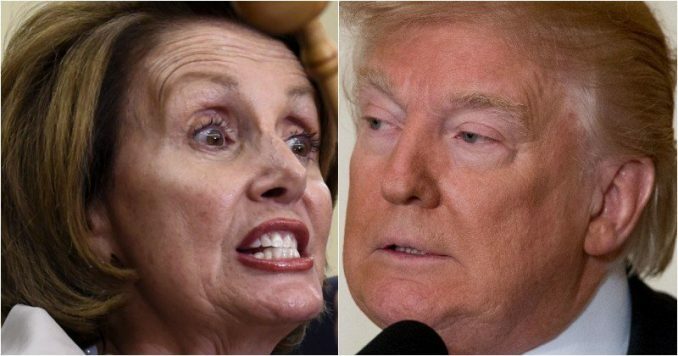 Pro-life Americans are rejoicing over this awesome plan Trump implemented that the pro-abortion Nancy Pelosi and her cohorts never saw coming. Now, they are freaking out. You’ll love this. Planned Parenthood, who makes 99.9% of their money from abortions, used Title X for years as a means to get taxpayer funds. Title X funds are supposed to be used to help low-income women and men receive birth control, cancer screenings, and other health care services. Well, President Donald Trump just changed Title X. No longer can Title X be used to obtain abortions. “The administration’s changes to Title X family planning grants have angered the abortion chain Planned Parenthood, prompting a lawsuit, but they provide hope for life-affirming pregnancy centers, which can now compete with the abortion giant for the federal funds,” Life News reports. While the tax money cannot be used to pay for abortions, it indirectly funds Planned Parenthood’s vast abortion business, but no more. “Under the new directive, which will take effect in 60 days, organizations receiving Title X funding have 120 days to financially separate their family planning and abortion operations and one year to physically separate their family planning and abortion operations,” added Life News. The “Protect Life Rule,” as that proposal is known, was finalized today. And pro-life groups are delighted by the news. “We thank President Trump for taking decisive action to disentangle taxpayers from the big abortion industry led by Planned Parenthood,” said Susan B. Anthony List President Marjorie Dannenfelser. “We thank President Trump and Secretary Azar for ensuring that the Title X program is truly about funding family planning, not abortion,” the SBA president added. Pro-life Americans, who have been sickened by the Democrats latest standard of engaging in infanticide, are utterly rejoicing over this news. That’s why Nancy Pelosi is freaking out. “House Speaker Nancy Pelosi called the move a ‘domestic gag rule’ and ‘strikes a staggering blow to women’s basic health rights,”‘ the Daily Caller reported. The Speaker also sent out her minions to act outraged over Trump saving the lives of babies. “I am committed to fighting the implementation of this rule,” said Rep. Rosa DeLauro (D-Conn.), who leads the House’s health care appropriations subcommittee. Well, good luck. Even left-leaning media outlets are reporting these Democrats who are the backers of the abortion mills don’t stand a chance to overturn this. “The rule will be challenged in court, and precedent is on the Trump administration’s side,” POLITICO reported. For all those Never Trumpers who claimed Donald Trump would rule as a leftist and he cared nothing about Christianity in America, how wrong they are. Not only has Trump formed the most pro-Christian administration in 30 years, but he is also alarmed by the sheer evilness of abortion. And now he just did something about it. God Bless President Trump. Pray for him. So many anti-God Democrats want to watch his downfall. By our prayers and sharing this information, we can make sure he is re-elected in 2020.